I value routine. Our recent move has shown me how much I rely on it—and how much I miss it when it’s gone. For instance, for the past two years I’ve done my gym workout from 5:30-6:30 AM several mornings each week. Moving meant canceling my gym membership on February 27th. Buying a membership at a new gym close to our marina hasn’t happened yet thanks to our travel schedule. As a result, I haven’t had a decent workout for six weeks. It’ll be another month before my travel schedule slows down. I’ll be able to re-establish an exercise routine then, but heaven help me in the meantime. Prior to our move, my office was in our home. Now it’s an hour’s drive from where we live. I’ve made this trip six times in the past week. I envision writing for hours every day from the boat when life settles down, but for now I need to pack and ship books to upcoming speaking events as well as use my many file-cabinet-resources to prepare for them—and all those things are in my office. Before we moved to the boat, Gene and I enjoyed an eating routine that worked well for us. I cooked the bigger meal of the day at noon, and he’d run up the stairs from his office to join me for lunch. Now, because we drive an hour to work, we pack our lunches. We haven’t done this for decades! On the days I travel to the office, I need to plan ahead for supper—either put something in a crockpot or plan something easy to fix when we get home. What will happen to our routine of eating the bigger meal midday as opposed to the end of the day? And how will this affect our weight goals? Honestly, I haven’t had time to figure this out yet. I feel like my eating disciplines have fallen off the rails especially in light of having experienced wonky mealtimes overseas for the past month. Even my quiet time with the Lord has been impacted. Before the move, I enjoyed my sacred space—on my leather loveseat in our family room—every morning after my gym workout and before I began work. To say I haven’t figured out how to re-establish my spiritual routine is an understatement. It took a hit while we traveled and I feel like it’s still floundering. 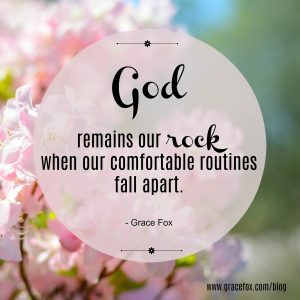 In the midst of change and loss of my precious routine, I choose to trust my Lord. He’s the One who led me to this change and He’ll lead me through it. He speaks peace, and as I listen to His voice rather than the negative one, I will experience His wonderful gift of peace. Question: Are you a lover of routine as I am? How do you feel when life shakes up your routine? What helps you cope? Oh my how I loved reading your words. They are the very echo of my own heart after our move and hubby’s retirement. What has helped me is #1: we know this is where God wants us #2: His voice to encourage me as He reminds me i am in the River of His love and the River does not run straight and #3 knowing God has truly prepared me for such a time as this and to walk through the doors He is holding open for me and #4 to enjoy the love of the Body He has connected us with and savour the deep, honest face to face relationships. Thank you for sharing wisdom, Jeannie. I totally “get” what you said. Especially #1 — we know this is where God wants us. When following His ways means making changes and losing one’s comfortable routine, He’ll be faithful to carry us. Our strength lies not in our routine but in His presence.